Before going to the socialengine and wordpress integration process, lets have a basic overview of two amazing and powerful php based frameworks “SocialEngine” and “WordPress”. SocialEngine is a software suite that allows creation of customizable online communities. It comes in two flavours: as standalone software package called SocialEngine PHP, and as software as service under the name SocialEngine Cloud. SocialEngine PHP is a PHP-based white-label social networking service platform, that provides features similar to a social network on a user’s website. Main features include administration of small-to-mid scale social networks, some customization abilities, unencrypted code, multilingual capability, and modular plugin/widget compatibility. There is a range of templates and add-ons available to extend the basic features already included in the SocialEngine core. SocialEngine Cloud is a SaaS, hosted version that facilitates interest graphs or communities of people with similar interests. The new cloud-based service lets anyone create a community website, including discussion communities similar to the microsharing style of Reddit, the photo curation style of Pinterest or activity stream style of Facebook depending on the theme. WordPress is a free and open-source blogging tool and a content management system (CMS) based on PHP and MySQL. Features include a plugin architecture and a template system. WordPress was used by more than 23.3% of the top 10 million websites as of January 2015. It is the most popular blogging system in use on the Web at more than 60 million websites. Install wordpress in the root directory of socialengine. Create a .htaccess file in the root directory of wordpress. Now we are ready to explore the seamless wordpress experience with socialengine. With the help of some plugins we can have our own ecommerce store with the social network community, get rid of multiple login and signup process, show our wordpress blogs on the socialengine networking site and show your products on the socialengine networking site. Lets dive into the detail of these plugins. SocialEngine Press Product Plugin for socialengine and wordpress integration makes it easy to quickly integrate WordPress eCommerce plugin with the SocialEngine. This plugin provides a business online easier and cheaper than it has ever been. This plugin turns your SocialEngine site into a full-featured online store. 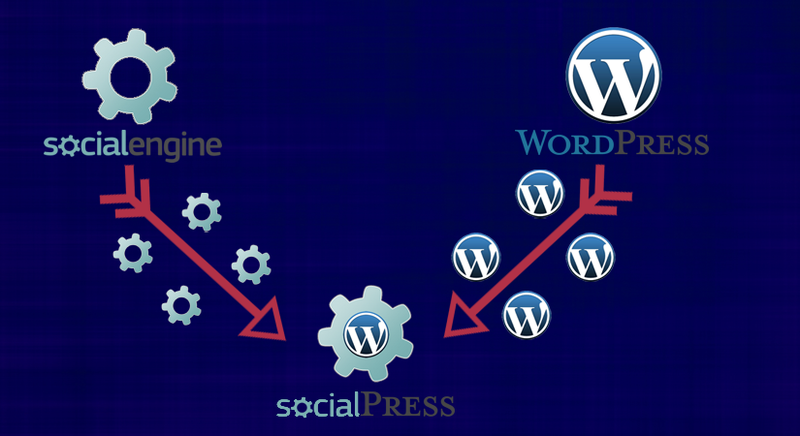 Socialpress- socialengine and wordpress integration is a very powerful, innovative and cheaper idea to give wings to your business. With Socialpress you could have your own social community and e-commerce at one place. If you have any query, feel free to contact us.